This recipe was incubated with my friend Eileen, and originated with Eileen’s mother. She raved about how filling and wonderful this old-school, hearty soup was and indeed it was everything I wanted and more. Sweet and sour, rich with meat and filling beets and cabbage…my red blood cells just gobbled up this dish. Eileen kindly gave me her mom’s original recipe but I actually (gasp!) quantified it and changed a few things even more for you, my dear readers. The original recipe was a bit sketchy on the details, so before I made it I phoned with many questions… Did she forget to list onions as an ingredient? (no) How thick should the flanken be? (thin) How small a cabbage? (the smallest you can find). Should I discard the tiny bones in the meat? (no, keep them in-but I didn’t listen to this bit of advice). Eileen even offered to come to my house after I made this dish to see if it was seasoned correctly. Hmmmm… I decided to try it on my own first and finally got the recipe to where I was happy. For me, getting the taste right was similar to seasoning meatballs rolled in cabbage. As an aside, she came over the following day and claimed it needed more lemon, garlic and salt. **Flanken short ribs are very different from traditional English short ribs most of you have seen; they are cut across the bones rather than parallel to the bones. 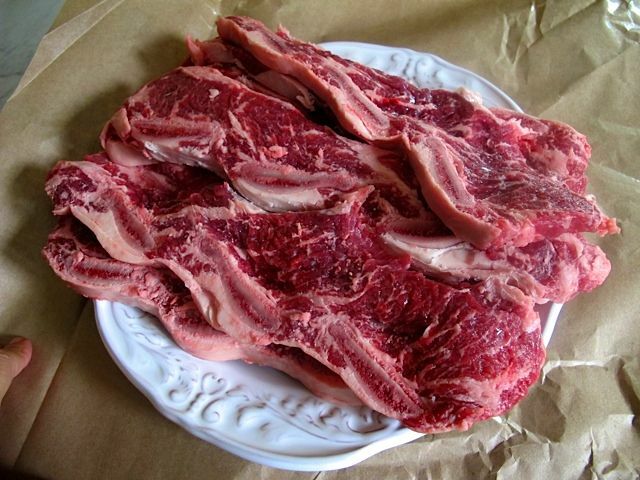 Just ask the butcher for Flanken style short ribs if you aren’t sure. ***Don’t get too neurotic about removing all the fat from the soup ribs before you start cooking because you can remove a solid layer of fat after the final dish is prepared and refrigerated overnight. Put meat and short ribs along with salt and water into a large soup pot. Bring to a boil, skim off foam and then cover and lower to simmer. Cook for 1 ½ hours. Add sliced beets and cabbage and bring back to a boil, lower heat and cover – cook for another hour, stirring every 20 minutes or so. 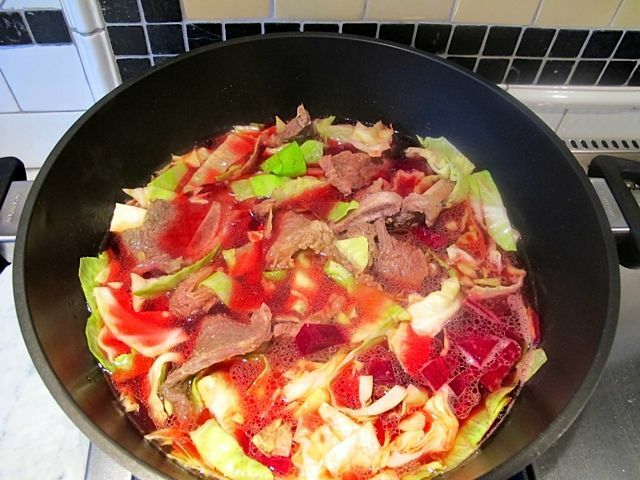 When you first add the beets and cabbage it looks so colorful and beautiful like in the photo – don’t get too excited because the whole soup cooks down and turns ruby red and the cabbage pretty much melts away. Remove the lid and add the lemon juice, sugar and garlic and put the lid back on. Continue simmering for a half hour. Taste for salt, lemon and sweetness and add more if needed. I take my tongs and remove the flanken – tearing the meat into bite sized pieces, cutting away visible fat and omitting the small bones. I made this on a Tuesday night and by Wednesday there was a layer of fat that had solidified on top. I easily removed this fat layer prior to serving. In true Ukrainian fashion, I ate mine with thick slices of boiled potatoes, rye bread and a hard boiled egg! This kind of simple, nurturing peasant food really speak to me. This is a great winter dish and makes enough for a few meals with leftovers to freeze. It is perfect when the temperature dips and you need something to warm the cockles of your heart. End note: apologies to everyone who lives in my condo building for the smells that emanated from my unit. I know cooked cabbage and beets isn’t the sweetest smell – but it sure tastes good! 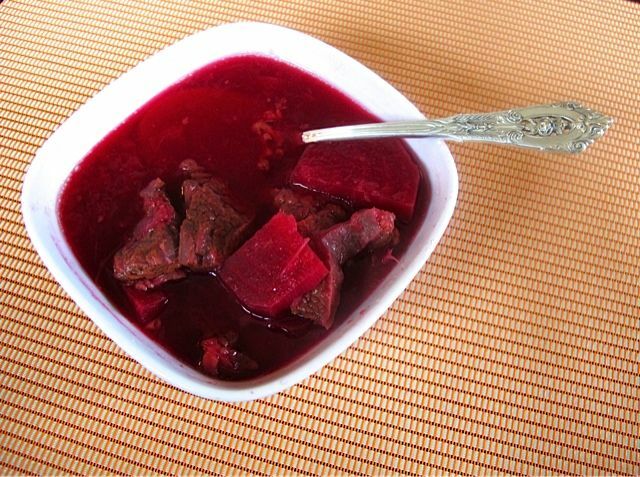 This entry was posted in Meat, Soups and tagged Beets, Borscht. Bookmark the permalink.